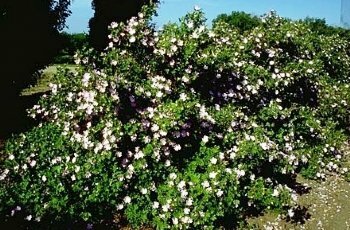 HANSEN HEDGE ROSE - a hardy, low to medium growing, thorny shrub which may reach a height of 4 to 6 feet. Growth form is upright to arching, roots sucker to form a dense thicket. The single pink flowers are followed by red rose hips. Thought originally to be an SDSU selection of Rosa rugosa x R.woodsii."